The Pew Research Center recently analyzed U.S. Census data to learn more about the next generation of Americans, who are currently 6 to 21 years-old. 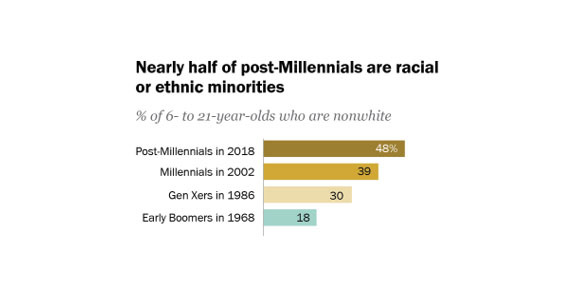 This generation, referred to as the “post-Millennial” generation, is “the most racially and ethnically diverse generation” yet, with almost half (48%) identifying as a racial or ethnic minority. In 1986, a little less than a third (30%) of Gen Xers identified as a racial or ethnic minority. So far, post-Millennials who are 18 to 20 years-old are also graduating from high school and enrolling in secondary education at a higher rate than previous generations. Among those who were not in high school in 2017, about six out of ten (59%) were enrolled in college. In 1986, around four out of ten (44%) of Gen Xers were enrolled in college. In particular, the portion of Hispanic students enrolled in college is higher for the post-Millennial generation, with more than half of that group (55%) enrolled in college, compared to around one third (34%) in the Millennial generation. The portion of young people who identify as Hispanic has also increased: one out of four (25%) post-Millennials identify as Hispanic, while 18% of Millennials identified as Hispanic. The proportion of black and Asian youth in the post-Millennial generation is similar to the Millennial generation. While the post-Millennial generation is racially and ethnically diverse, the majority of individuals were born in the United States. Only 7% of post-Millennials were born outside of the U.S.
For academic, school, and public libraries, these demographic characteristics may be helpful for understanding how to best serve this generation, both now and in the future. There are initiatives, like the Inclusive Internship Initiative, to recruit more inclusively for librarians. In addition to increasing diversity among library staff, what services, programs, spaces, and collections will be most relevant, useful, and engaging to this generation? For the Latino community in particular, some examples of innovative outreach are the GENIAL Summit at the Exploratorium in San Francisco and the Latino Collection & Resource Center at San Antonio Public Library. Public Libraries Online also shares ideas for strengthening community engagement with the Latino community here. You can read the full Pew Research Center report on the post-Millennial generation here.